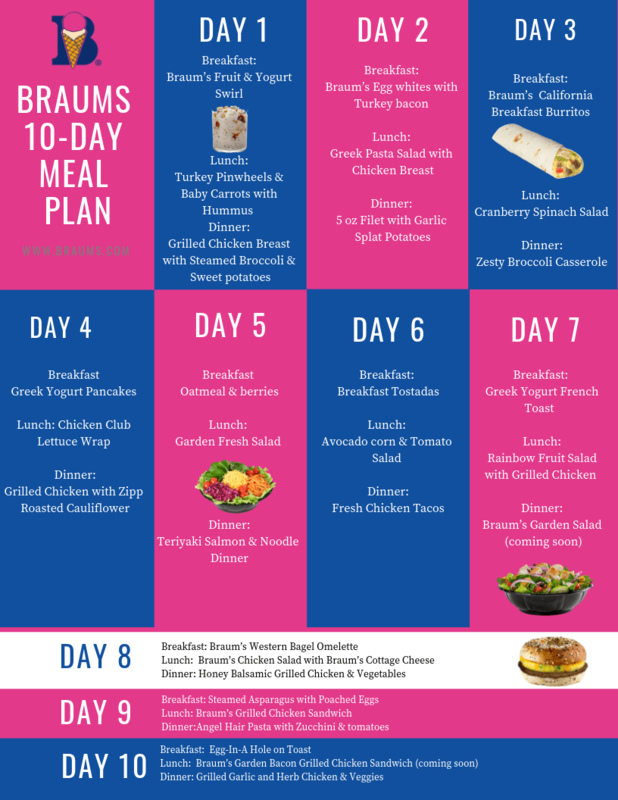 Start the New Year off right with our 10-day Meal Plan. These healthy items are available at our Market Fresh store for everyone to enjoy! Combine cream cheese and ranch dressing and divide equally between the two tortillas. Spread evenly, covering one whole side of each tortilla. Top each tortilla with half of the turkey, bacon, roasted red peppers, and avocado slices. Roll up tightly, being careful not to squeeze the toppings out of the sides. Wrap tightly in plastic wrap and refrigerate for 30 minutes or until the wraps are firm enough to slice. Cut the broccoli into bite-size pieces and spread them on half of the baking sheet. Cut the chicken into bite size pieces and season with whatever seasoning you wish. Drizzle the broccoli and chicken with olive oil. On another pan, place the cubed sweet potatoes and drizzle with olive oil and sprinkle with salt. Spray the steak lightly all over with olive oil, then season both side generously with kosher salt and black pepper. When the oven is ready, heat the skillet over high heat until the pan is very hot. When hot, add the steaks and cook, without moving for 2 1/2 minutes. Turn over and cook an additional 2 to 2-1/2 minutes. Sear the sides of the steaks for about 1 minute so it’s browned all over. Place the steaks in the oven for about 4 to 5 minutes, then check them with the meat thermometer inserted into the side of the steak. Remove when the steaks read 125° F for Medium Rare or 130° F for medium. Let them rest 5 to 10 minutes before serving (meat temperature will rise 5 to 10 degrees after it is removed from the oven). Season chicken inside and out with salt, pepper, and herbs de Provence. Squeeze half of the lemon on the outside of the chicken and stuff the remains of the lemon along with onion, garlic, rosemary sprigs inside the chicken. Transfer to a sheet pan, and tie the chicken by taking kitchen twine and plumping up the breast, then coming around with the string to lasso the legs and tie them together. Don’t forget to tuck the wing tips under themselves so they don’t burn. Roast the chicken with the feet towards the back of the oven, until the juices run clear, and internal temperature is 160°F, about 50-60 minutes (Insert thermometer between the thickest part of the leg and the thigh). Let the bird rest for 10 minutes, tenting with foil before carving. Serve chicken, either one breast, or one thigh/drumstick, skin is optional. Nutritional values will be vary depending on which part of the chicken is consumed, skin on or skin off. Roll the dough out on a well-floured work surface until it’s approximately 11 to 12-inches in diameter. Transfer it to a 9-inch metal or glass pie dish. Using your fingers, press it firmly into the bottom and sides of the pie plate. Trim off any excess, leaving about 1/2-inch overhanging. Then fold/crimp the overhanging dough. Prick the bottom of the pie crust with the tines of a fork. Transfer the pie crust to your pre-heated oven and bake for 10 to 15 minutes, until par-baked. Meanwhile in a large mixing bowl combine eggs with spinach, milk, 2 tablespoons parmesan cheese, basil and salt; mix well. Pour mixture into the par-baked pie crust. In a small bowl combine ricotta with mozzarella and remaining parmesan. Dollop the ricotta all around and top and place tomatoes around the cheese. Place foil on the edges of the crust to prevent them from burning. Place the parchment paper down on your work surface. Layer 6 to 7 large leaves of lettuce in the middle of parchment paper so that you create a lettuce base about 9 inches by 10 inches. Spread the mayo in the center of the lettuce wrap. Layer with the chicken or turkey, bacon and tomato. Starting with the end closest to you, roll the lettuce wraps jelly roll style using the parchment as your base as tight as possible. Halfway through rolling, tuck the ends of the wraps towards the middle. Continue to roll the lettuce wrap, keeping it as tight as possible and using the parchment paper to guide you. When it is completely wrapped, roll the remainder of the parchment around the lettuce tightly. Using a serrated knife, cut the lettuce wrap almost completely, leaving a small piece of the parchment intact to help hold it together. Put veggies on 1 large grill tray or 2 smaller trays (or cook in batches), spray with olive oil, season with salt and pepper and cook, turning constantly until the edges are browned, about 6 to 8 minutes. Set aside on a dish. Cook the chicken about 4 to 5 minutes on each side, until grill marks appear and the chicken is cooked though, transfer to a platter, too with the veggies and pour the balsamic dressing over everything. Design your taco. Add chicken, lettuce, avocado and top with feta cheese serve with lime wedges. Cut the bread in half lengthwise, then cut each half crosswise in 2 pieces to give you 4 pieces total. Tear the cheese into pieces and place on top of the bread. Remove when the steaks read 125° F for Medium Rare, or 130° F for medium. Combine eggs, yogurt, cinnamon, stevia and vanilla in a shallow dish. Stir well with a fork or whisk. Place griddle over medium-low heat and add butter. Once the butter had melted, dunk bread in egg mixture, allowing excess to drip off.